For those who don’t know, I’m taking a road trip to Idaho a week from tomorrow (my birthday! ), and two weeks from yesterday I will be competing in the USA Cycling Mountain Bike Cross-Country National Championship, Senior 19-29 Cat 3 (here by referred as “Nationals”). And well, I’m rather unprepared. I was really hoping that I would be able to start doing some hard training right after the finish of the last race of the Sun & Ski Sports 2012 Texas Mountain Bike State Championship Series (what is with these names? SOOOOO LONG. Also: 9th place in the state. ), but something wasn’t there. The joy. The excitement. The energy. It was all gone. I was burnt out. I think it started a week or two before the last race, that’s probably why I was so okay with just riding and having fun (and placing behind Justin). So training wasn’t something that I could mentally do for three weeks after that race, almost four. That’s a whole month that I’ve missed out on. I’m not physically at my peak. I mean, I am 80% certain that I will finish the course but the fact that haven’t got to develop my muscles the way that I was hoping. And I was going to need huge muscles. 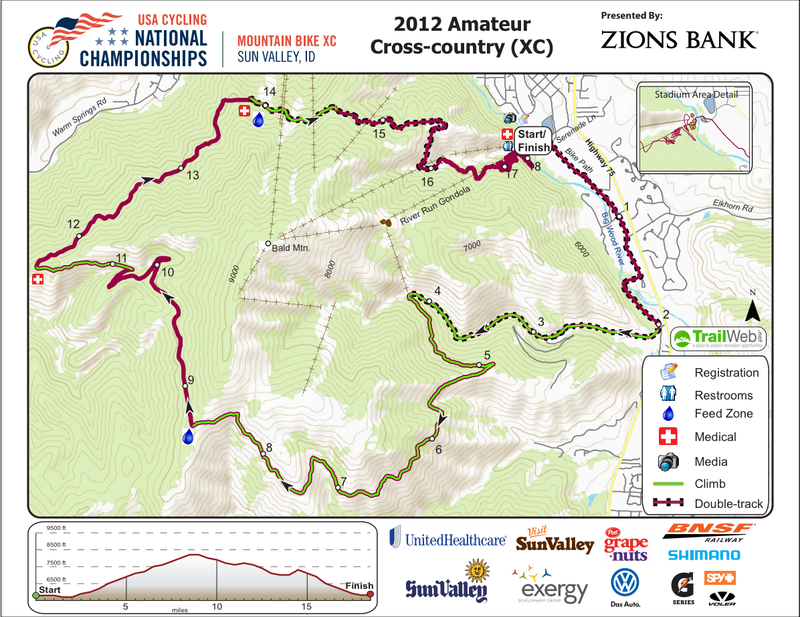 The course that they have up on the website (Image) shows what looks like almost 16 mile loop with almost 8 miles of climbing on the first half. I AM NOT PREPARED FOR THIS. I’m from Texas, I’m not sure how well I’m going to be able to climb from 5,600′ to 8,400′. We don’t have mountains here, we have hills. I live in the Hill Country, which make the Foothills that I used to live in look like the freakin’ Himalayas. The longest course I’ve raced on was a total of 12 miles, and that was looooong. What’s the extra 4 miles going to do? How am I going to handle the climbing. Oh, and there’s this little nagging worry in the back of my head that says “Andrew, you haven’t been over 3,000 feet in like 6 months. You might die”. I don’t like that voice. I tell that voice to shut up and that I used to go up that high all the time with no problems. And secretly hope I’m right. And there’s the whole packing thing. A two-week road trip that spans five different states, with 3 outdoor activities planned, not to mention food and nutrition for the race, the road, and while I have to fend for myself. How many gels am I going to need for a race this long? What about water? What do I need to do before I leave? Oh, man… I need to make a list. This entry was posted in Bike, Life, Racing on June 20, 2012 by Andrew. Dude that’s intense!! I’m sure you do fine though. I enjoyed reading your post. You should write more often!